Westside Subway Extension timeline: we're down to the final five. 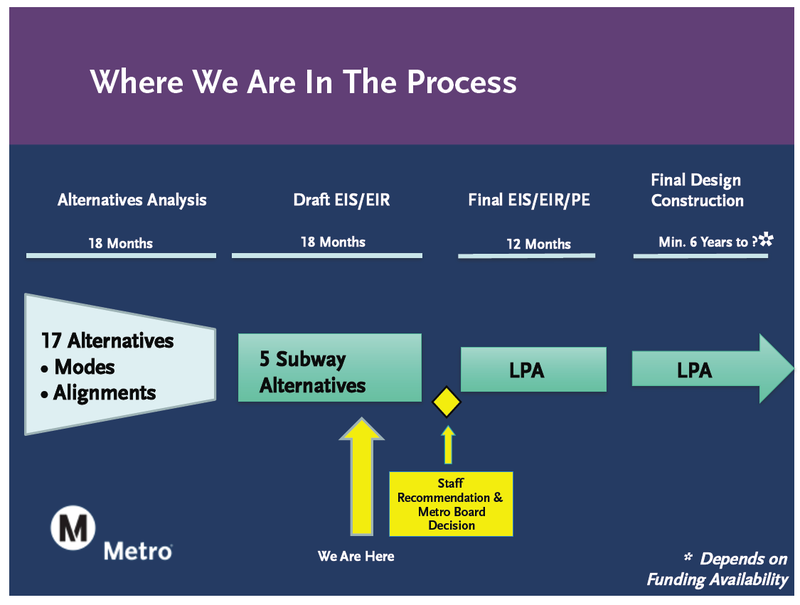 Five meetings have been scheduled throughout the next month to update the public on the Westside Subway Extension Project as Metro moves towards releasing the Draft Environmental Impact Statement/Report (EIS/EIR). These meetings are meant to get the public up to speed on the project before the Draft EIS/EIR is released later this summer. The same material will be presented at each meeting, so just choose a time and place that works best for your schedule. The meeting on June 28th will be streamed live on the web for those who can’t make it to the physical meetings. Served by Metro Lines 20, 720, 920, 217 & 780. Validated vehicle parking is available in the Museum’s 6th Street underground garage. Enter from 6th and Ogden. Spanish & Korean translation will be provided. Served by Metro Line 4. Free vehicle and bike parking is available. Russian translation will be provided. Served by Metro Line 20. Spanish translation will be provided. This meeting will be streamed live on the web. To view, go to metro.net/westside. Served by Metro Lines 4, 14, 16 & 704. Free 2-hour parking is available in the adjacent structure. Served by Metro Lines 4, 20, 333 & 720 and Santa Monica Big Blue Bus Lines 1, 2, 3, 7, 8, 9, and 10. Validated vehicle and free bike parking is available. Read the full press release from Metro Media Relations, after the jump. The Los Angeles County Metropolitan Transportation Authority invites the public to the last round of community update meetings on the Westside Subway Extension Project prior to the agency’s official release of the project’s Draft Environmental Impact Statement/Report (EIS/EIR). Meetings will present additional data on the performance of the five alternatives now under study in the EIS/EIR. They will also provide another opportunity for the public to learn more about the project and receive updates before the agency releases the Draft EIS/EIR and holds formal public hearings anticipated for later this summer. Monday, June 14, 2010; 6 – 8 p.m., LACMA West – Terrace Room, 5th Floor, 5905 Wilshire Boulevard, Los Angeles, CA 90036. Served by Metro Lines 20, 720, 920, 217 & 780. Validated vehicle parking is available in the Museum’s 6th Street underground garage. Enter from 6th and Ogden. Spanish & Korean translation will be provided. Thursday, June 17, 2010; 6 – 8 p.m., Plummer Park – Great Hall, 7377 Santa Monica Boulevard, West Hollywood, CA 90046. Served by Metro Line 4. Free vehicle and bike parking is available. Russian translation will be provided. Tuesday, June 29, 2010; 6 – 8 p.m., Beverly Hills Library Auditorium – 2nd Floor, 444 N. Rexford Drive, Beverly Hills, CA 90210. Served by Metro Lines 4, 14, 16 & 704. Free 2-hour parking is available in the adjacent structure. Spanish translation will be provided. Thursday, July 1, 2010; 6 – 8 p.m., Santa Monica Public Library – Multi-Purpose Room, 601 Santa Monica Boulevard, Santa Monica, CA 90401. Served by Metro Lines 4, 20, 333 & 720 and Santa Monica Big Blue Bus Lines 1, 2, 3, 7, 8, 9, and 10. Validated vehicle and free bike parking is available. Spanish translation will be provided. Special ADA accommodations are available to the public. All requests for reasonable accommodations must be made at least three working days (72 hours) in advance of the scheduled meeting date. Please telephone the project information line at 213.922.6934. The TDD line is 800-252-9040. The Westside Subway Extension Project team is currently evaluating five different alternatives for extending transit service to West Los Angeles. All of the alternatives currently have a common subway segment on Wilshire Boulevard extending to Westwood/UCLA. One alternative also extends to Westwood/VA Hospital, one alternative extends to Santa Monica, one alternative includes the extension to Westwood/VA Hospital and adds a possible branch through West Hollywood, and one alternative includes both the extension into Santa Monica and the possible branch through West Hollywood. As part of the environmental review process, the project team must also evaluate a No-Build Alternative and a Transportation Systems Management (TSM) Alternative. The agency’s Board will consider staff recommendations in the fall. For additional information, visit the Westside Subway Extension project web site at metro.net/westside. Project information also can be found at Facebook.com/WestsideSubwayExtension. The project information line is 213-922-6934.